We surveyed 1,000 Irish home-owners asking them quetsions about their home security. Almost one in three Irish people have experienced a home burglary. Dublin residents are most likely to have had an intrusion with 40% of Dublin homes experiencing previous burglaries. 1) One in four adults in Ireland have previously been the victim of a break-in. 28% of Irish adults in total have had a home intrusion before. Dublin had the highest number of break-ins, with 40% of Dublin residents reporting that they've been broken into in the past. Munster is the safest region with just 17% home intrusions in that province. 2) Half of all break-ins happen between 5pm - 11pm. Even though, you may think your house will be more vulnerable in the middle of the night or in the day when you're out at work, but in fact over 50% of home burglaries in Ireland happen in the evening, when you're likely to be home. 3) Only 40% of people set their alarm at night. This could be one of the reasons why burglaries are so common in the evening, early night time, because they'll know alarms aren't being set. Another reason could be people's alarms technology may be out of date and there's no function to set the alarm when you're home at night. With our ZeroWire™ home alarm system, you can use a 'Stay' function, protecting the interior of your home, but allowing you to safely walk around without setting off any of the motion sensors. We found that over 50% of alarms are six years or older, it's vital to update your home's security, given it the protection it deserves. 4) 79% of break-ins occur through the front door, back door and back window. Burglars don't carry ladders, so they're more likely to enter on the first floor. We will also add sensors to your most vulnerable areas and common entry points, to make sure your home is secure as possible. If someone does force enter their way into a door or window, it will sound the alarm and our monitoring station will be immediately contacted. 5) The average amount stolen from a break-in in Ireland is €600. The most common items stolen are jewelry, cash and televisions. With HomeSecure, you can make your home three times safer with a monitored alarm, protecting you against the threat of a break-in. The Intruder Deterrent AlarmBox, we'll install for the exterior of your home will state 'HomeSecure monitored alarm', which will deter burglars from even attempting to gain access to your home. 6) 46% of Irish households, don't have any kind of alarm. With around 2,000 break-ins a month in Ireland, it's important to secure your home against a potential attack. Burglars want to make their job as easy as possible, so if they see one home with an alarm and another with no alarm, they will target the house that isn't protected. Don't allow your home to be a vulnerable protection. We offer new house alarm systems for first time alarm customers for an unbeatable €199. 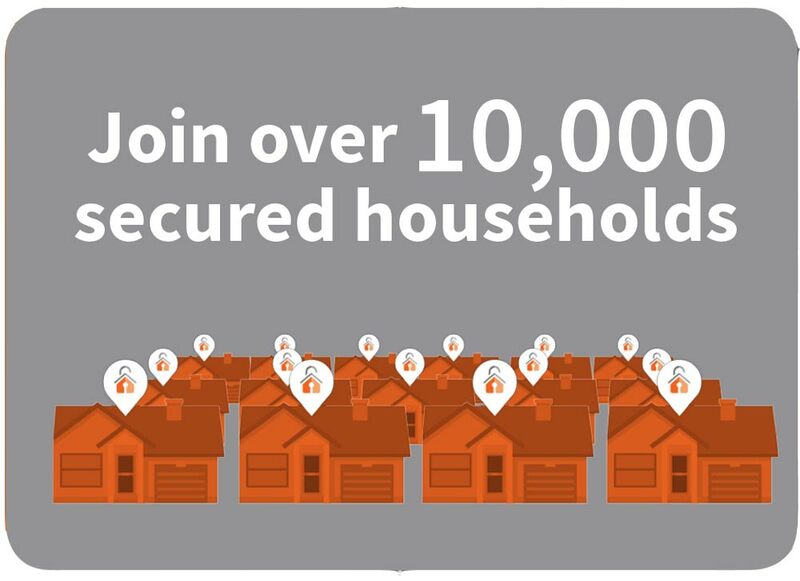 ndependent Research carried out by Accuracy Research on behalf of HomeSecure. Results based on 1,008 respondents and are nationally representative. Additional security stats taken from on Garda Siochana website site and other industry sources.